Aviemore is a town in the Highlands of Scotland, in the area of Badenoch and Strathspey. 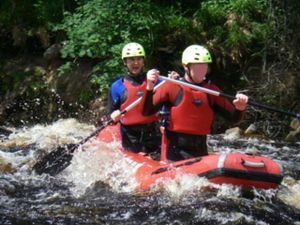 It is a popular destination for outdoor activities and within Cairngorms National Park. First Scotrail  services link Aviemore with Edinburgh, Glasgow and Inverness several times a day. East Coast  runs a daily service between Inverness and London via Aviemore. The service calls at principle stations including Edinburgh, Newcastle and York. The Caledonian Sleeper  also connects the town with London six nights a week. Aviemore is just off the A9, the main road north to Inverness. Buses from Edinburgh, Glasgow and Inverness, operated by Citylink . There are two main taxi companies in Aviemore - Weirs of Aviemore and Geordies. Rapsons, the coach company, runs regular buses around Aviemore, the Cairngorm Ski area and around the Spey Valley. Aviemore railway station handles trains from Inverness south, including destinations such as Edinburgh, Glasgow and England. There are many official paths around Aviemore including the Aviemore Orbital and walks around the Lochs and the Cairngorm Mountain. Hillwalking - many mountains nearby, the Cairngorms includes 4 out of 5 of Scotland's highest mountains. Mountain biking & Quad Biking - numerous forests nearby, with tracks and paths suitable for off-road cycling and riding, eg. Rothiemurchus, Glenmore, Glenfeshie. Laggan Wolftrax  (about 35km from Aviemore) is a network of purpose built mountain bike trails, as well as a cafe and shop / bike hire. Fat Face -- Fashionable outdoor leisure clothing and footwear. Trendy & fairly expensive. Bothy Bikes -- Located at Inverdruie on the Ski Road to Coylumbridge. Great stock of quality bikes, cycle clothes and accessories with local cycle trails right on the doorstep. Repairs and servicing also available. Knowledgable & friendly staff. Nevisport -- Outdoor and sporting equipent and clothing. Blacks -- Camping and outdoor equipment and clothing. Frasers Butchers -- Award winning Butcher shop with some of the best sliced sausage you are ever likely to taste. Sue Ryder Charity Shop -- Secondhand clothing charity shop. Sometimes good for bargain skiing/sporting gear. Also good for cheap books. Fat Treads -- Located at the rear of Myrtlefield Shopping Centre. Quality cycling gear and bikes available as well as a repairs service. Good advice to be had, if a little on the expensive side. Julian Graves -- Local branch of the nationwide healthfood shop chain. Ottakars -- Book shop with a fairy good range of stock including local OS maps and games. Semi-Chem -- For toiletries and personal care items. The Cairngorm Hotel, Grampian Road, opposite the Railway station. "The Cairn" as it is known locally is home to a traditional style pub/lounge and restaurant. As well as the usual international beers they also offer a range of locally brewed beer and ales. Food is more expensive than normal pub fare, but is of a very high quality! Excellent service. The Old Bridge Inn, Dalfaber Road, behind the Railway station. Another of Aviemore's tradtional style pubs. Has an open fire in the evenings. Has outdoor seating area facing the river during the summer. Good food & beer, but a bit expensive for your average backpacker. The Winking Owl, Grampian Road. Semi traditional in style and a bit rough round the edges, but serves yummy pub grub and has a good atmosphere. The Skiing-doo, Grampian Road, near the Post Office. Theme bar with old signs, posters, skis and various other strange items adorning every surface, including a Griffins SC of Enfield swimming hat and a Gillingham FC mini scarf! Great surf'n'turf! Try their Garlic Burgers! YUM!! The Vault, Grampian Road, just down the stone steps near the public toilet/showers. One of two of Aviemore's night clubs. Plays mainly popular chart music however also has a electronic/techno music scene, with the club having various electro nights seeing such act as Cagedbaby and DJ Fergie play in this small club, it is probably the most popular place to go at the end of the night when all the other pubs close. Harkai's -- 45 Grampian Road, 5 mintues for the Youth Hostel on the way into town. Fish restaurant with connecting chip-shop take away. Good range of fish and good quality food. Muckrach Hotel and Restaurant, Dulnain Bridge, PH26 3LY tel:01479851257  [email protected] This small stylish hotel serves wonderful local produce including fruit and vegetables grown in their own kitchen garden. Aviemore has many hotels and a couple of hostels to suit every need from the common travelling backpacker to corporate executive attending the local conference centre. Ravenscraig Guest House, Tel 01479 810278, email [email protected], . The Ravenscraig Guest House is on the main street towards the north end of the village. The guest house has great annex rooms at the rear and the breakfast is awsome. All rooms are ensuite with TV and tea and coffee making facilities. Moorfield House Hotel, Tel 01479 831646, . A stunning Victorian Guest House / Bed & Breakfast offering luxurious accommodation is in Boat of Garten (5 miles from Aviemore)in the Highlands of Scotland. Offers 4 Star (STB) accommodation where informality and a warm welcome are the key to your visit. Fully non smoking and licenced, ideal for those of you wanting comfortable, relaxed and peaceful surroundings. All bedrooms have en-suite facilities. Muckrch Hotel and Restaurant, Tel: 01479 851257, A very handsome Victorian shooting lodge set in 10 acres of grounds located 12 miles from Aviemore. Stylish and relaxed, Muckrach lodge is the perfect place to explore the breathtaking rugged beauty of the Cairngorms national park. See "Eat & Drink" above. This page was last edited on 4 November 2017, at 17:32.